and after that we found the sea. Were your navigating skills in question? Shocking! I must admit to a chuckle! 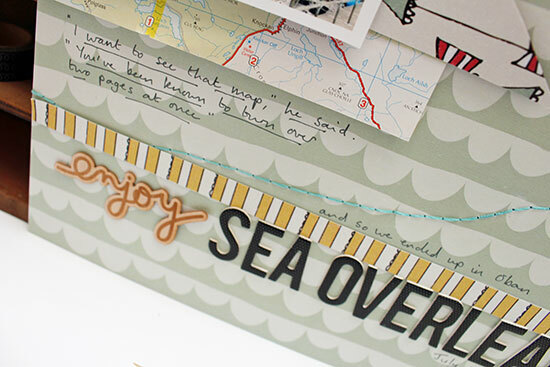 Cute story ... just think of the adventures to be had with your style of map reading. Not trusted as the navigator then? I suppose turning two pages at once makes the journey quicker........? I have NEVER been trusted as a navigator, but I would like to point out that twice (perhaps three times) I have been correct in navigational questions while on our current road trip. After 28 years of marriage, we finally came up the perfect navigating solution - I drive, he directs. Lovely page - I like the way the stitching contains the large elements and looks as though it's trailing the little striped sailboat like a cloud. Sounds like you and I have similar map reading skills ... plus I have no sense of direction so have no warning that things have gone horribly wrong! Oh, just lovely! I can smell the salty air from here ... Smiled about the map-reading. I have some stories about my own parents in the car! i like your little flags and, of course, your signature bird :). A real map? My, my so nice to know someone still uses them. I'm usually the navigator in our family but we really haven't gone anywhere by car lately so I'm probably out of practice. Lovely layout. Oh, yes, road trips! 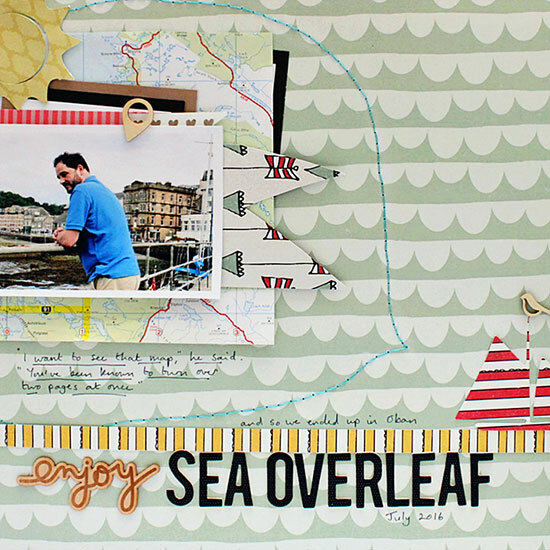 :) I just love the way all your bits & pieces help tell the story here!